With our in-house state-of-the-art CAD system, WD Industrial Group has the ability to act as an OEM (Original Equipment Manufacturer). We can see a custom job all the way from design to the finished product. To keep jobs as economical as possible, we can also work from existing moulds. We handle many large runs, however, our real advantage is the ability to take on smaller runs without the high cost normally associated with limited production. WD Industrial can deliver low mould costs on a wide range of products while maintaining economical production costs. WD Industrial has manufactured a range of plastic products for home decoration, recreation, transportation, agriculture, and waterworks industries. These plastic parts can replace almost any cast iron, cast aluminum or other corrosive material you may be using. With plastic, expect stronger and longer lasting products that, in most cases, cost less to manufacture. Products can be manufactured using polymers, ABS, PVC, nylon, polypropylene, polycarbonate, and virtually any other kind of available plastic. 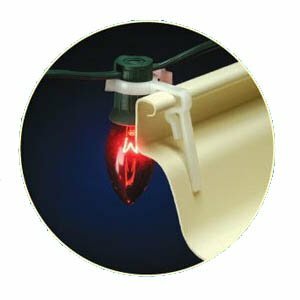 Our Universal Light Clip easily attaches to eavestroughs and shingles in seconds. With its unique design, the clip fits C7, C9, LED, and mini-lights. Universal Light Clips are premium quality and are extremely durable in cold climates. WD Industrial manufactures plastic dock cleats to help keep your boat secure - contact us for more information.